I would like to prepare myself for the next spring when I want to buy some bonsai-pots for some of my trees; who are still in training pots. What are the criteria for pots for this kind of trees? What about the colors? Any advice is highly appreciated!! Thanks! 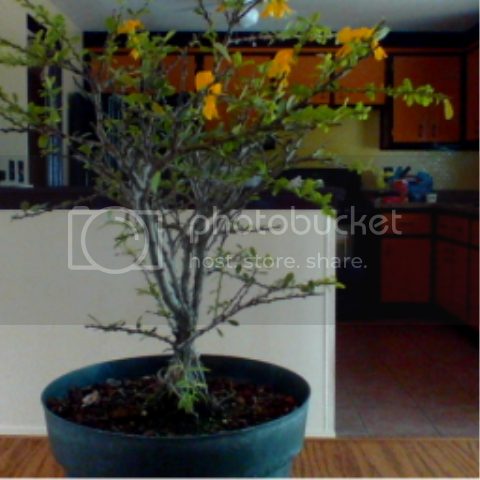 I would like to add to this question-- where can you BUY bonsai pots? How do get a bogenvilla to grow like crazy in Chicago? 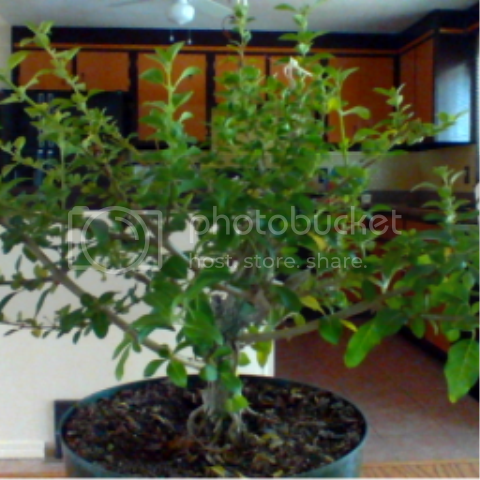 Also Dallas bonsai sells pots,so does bonsai monk among others. 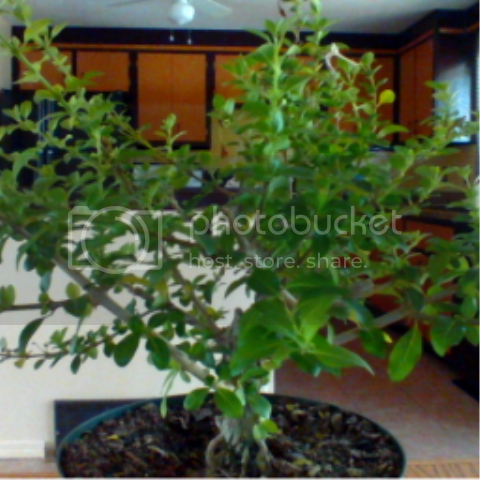 Bonsai By the Monestary (in Conyers GA) was my best value for both mica and ceramic pots. 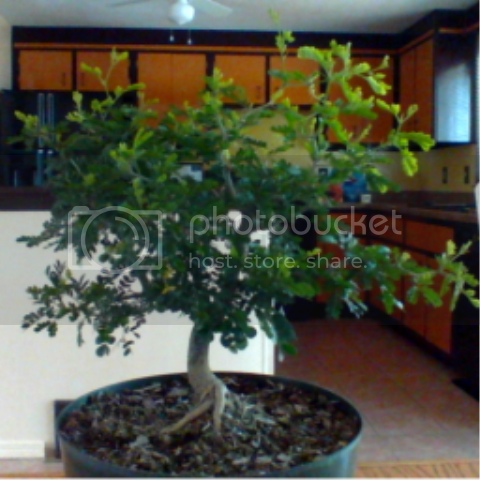 Y'all kind of hijacked the OP's question a bit, which wasn't about where to buy bonsai pots, but was about the aesthetics of bonsai pots, how do you match up the right pot with the right plant, how do you decide what color/ shape/ size/ texture etc of pot will show your tree to the best advantage and work best with the tree. Any comments on aesthetic principles? @GBHunter; I guess itÃ¢â‚¬â„¢s just beginners luckÃ¢â‚¬Â¦but IÃ¢â‚¬â„¢m able to give a lot of sun; and this summer is very hot here. Next; I rinse the filters from my fish tanks every week and I give that water to my trees. Believe me; thereÃ¢â‚¬â„¢s a lot of Ã¢â‚¬ËœstuffÃ¢â‚¬â„¢ in that water! @Rainbow; you are right; I would like to know Ã¢â‚¬Ëœthe rulesÃ¢â‚¬â„¢ of the pots. Beginners should not spend a lot on starter pots. Drainage holes are a must. Plastic pots are available in many sizes. However they tend to be very light weighted and can be tipped over easily - especially when the plant material is tall or heavy. Korean 'mica' pots are better if your plant is bigger/heavier. Starter pots should be a bit larger (for 'growing out' purposes) than a more 'finished' pot will be. Over time a smaller pot will be required to present a better proportion or scale. You will often hear that with a 'finished' tree, in some styles, the height of the pot should only be as tall as the thickness of the trunk at it's base. Other factors to consider - masculine and feminine features of the 'tree'. A masculine tree is one which is usually bold, full, often short, squatty, thick trunked. A more feminine tree then would be leaner, lighter, shapely, more sparse and airy. Pots for the masculine tree should be heavier in appearance, blocky, square or rectangular, darker colored, with simple feet and little or no decoration. Likewise the more feminine tree gets the curves, oval or round pot, more elaborate feet, and decoration. Pots for evergreen trees, hardy trees should not be glazed - but rather in earth tones, shades of brown to accentuate the colors of the bark. Deciduous trees can be in glazed pots with colors to compliment or accent the foliage - and it gets a bit more complex here. Flowering tropical trees should have colored pots which will work well with the tree while both in bloom or not AND not 'steal the show'. Colors and shades of the flowers and the foliage in Fall can call for nicely colored pots - but -the boldness of the pot should not draw all the attention from the tree but rather accent it/compliment it. My 'advice' is a bit basic here. There are many variables to be considered. I'm not an authority on these matters but many bonsai books devote chapters on this topic. If your club has a library you will likely find the answers to these questions with a little research. ....as for the off-topic comments on bougainvillea please refer to the new thread with that heading. Agreed it gets tricky when/once you've styled a species or have a style in mind, but agree with the basics. For the best advice we can give, we'd really need to see pictures of the individual trees. Thank you very much; Tom, you gave a lot of info; I have a lot to think about! I think I have to go with the heavier pots; since my trees are pretty heavy and it is very windy here. 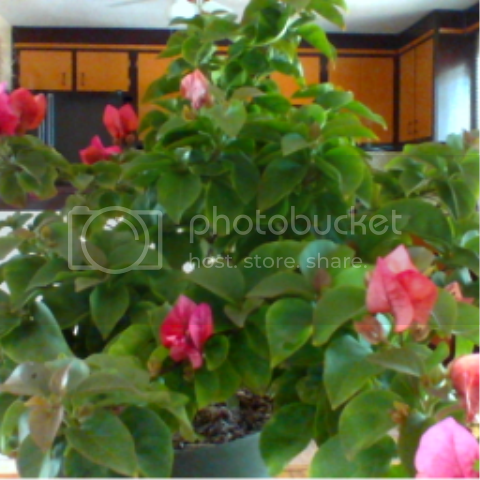 The colors can be a problem; I am fine with a dark red pot for my bougainvillea. Escanbrons have little white flowers; I think a white pot is just too much for this kind of tree; same for the Rain tree; an orange pot? Thanks for your reply; KDodds. I have some pics here; just made them with my webcam; my camera is -of course- somewhere. As you can see; some trees needs a hard pruming; too. Because of the weather; they are all growing fast. 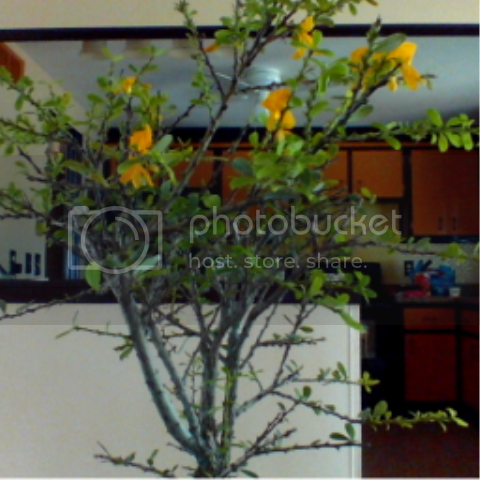 Even my Sweet Acacia -did not do a thing the last two years- grows well! Any tips are very welcome! Tom wrote: 'the height of the pot should only be as tall as the thickness of the trunk at it's base'. I just measured the trunks; most of them are almost 2 inches. So the height of the pot should be around 5 centimeters. This means a lot of root pruning. Also; the branches need a lot of pruning. Can I do did in one session? Some trees are pretty heavy. Please note that this recommendation for pot height is for a 'finished' bonsai, which yours is not. It is still nursery stock in deep nursery pots. 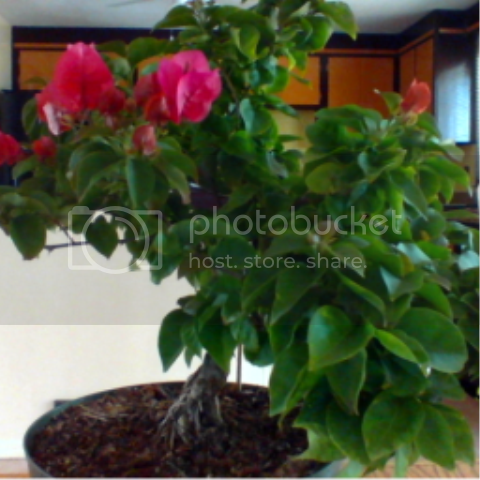 Do not try to take them down to little bonsai pots by severely root pruning your beautiful plants. Rather they should be reduced in multiple stages over about 6 years. A 'training' pot can be used after pruning off about 20-25% of the root mass and a similar amount of top pruning. After a couple years another reduction can be done with recovery in between. 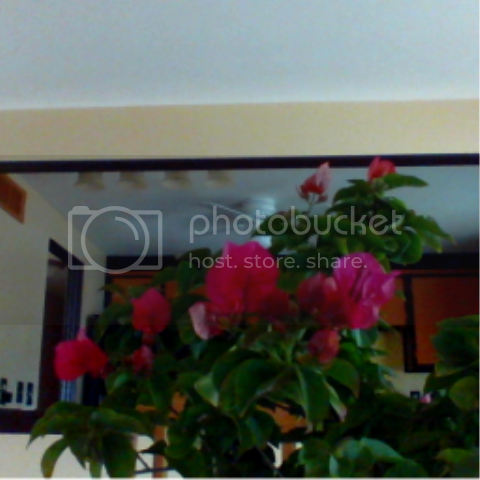 Please look again at my bougainvillea. It is in a finish bonsai pot - very low - but it took several 'reductions' to get it ready for such a low pot. It happens to be unglazed but would also work well in a soft blue. Please don't take this the wrong way but are you sure that you measured the diameter of the trunks and not the circumference? Granted that without anything to provide scale I am at a disadvantage but those trunks don't "feel" like two inches to me. Forgive me if I assume too much. Thank you; Tom! I learned a lot already! Norm; I used an Europian measure lint. Time to buy some American stuff! Can be very confusing; I measured 4 centimeters. 4 cm = 1.57 inches. But you can't exactly measure diameter with a measure tape (lint?). And the diameter of the nebari doesn't count, just the trunk. I had the same thought, Norm, when I looked at the pictures, but I was letting the real bonsai people handle it, in case I was off base.